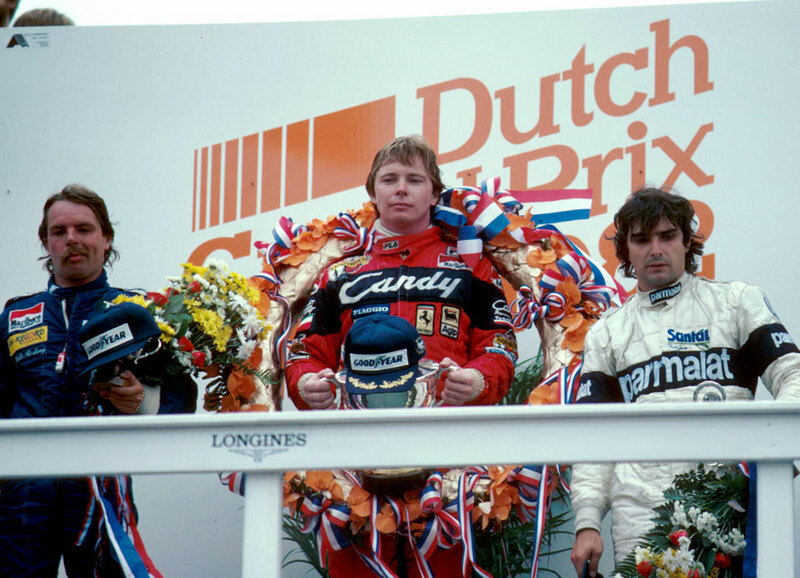 Didier Pironi won the Dutch Grand Prix from Nelson Piquet and Keke Rosberg shortly after walking away unscathed from a massive testing accident at Paul Ricard, his car somersaulting before landing back on its wheels. For the first time since the death of Gilles Villeneuve, Ferrari entered a second car, Patrick Tambay being lured out of a brief retirement which had resulted from the row earlier in the season at Kyalami. The Renaults of Alain Prost and Rene Arnoux occupied the front row and Prost had the jump on Arnoux at the start, but again neither car was able to last the distance. Prost's engine died before the halfway point while Arnoux escaped unharmed when he lost a wheel at the end of the straight, bouncing helplessly across the dunes into a tyre wall. Pironi, who had taken the lead at the start of the fifth lap, eased into a lead of more than half-a-minute before throttling back to conserve his tyres. Behind him Nelson Piquet had a much harder time in holding off Keke Rosberg. Derek Warwick surprised many by setting the fastest lap in his British-built Toleman-Hart and qualified in the middle of the grid. His day ended when first his rear wing flew off and then he suffered with oil pressure issues. John Watson, who came ninth after suffering from tyre problems, still led the championship but Pironi had narrowed the gap to one point.